Ever heard of a salt that smells like rats but tastes like heaven? Have you wanted to learn how to cook amazing food but don’t really want to leave Boulder for the Culinary Institute of America, in Hyde Park, New York? Do you just want some extraordinarily easy, authentic Indian food recipes actually found on family tables in India? Stay tuned, and this 3-part article will answer those questions. Auguste Escoffier, formerly the Culinary Institute of the Rockies not only trains chefs the techniques necessary to ‘go pro’, they teach regular food buffs some of the skills, tricks and recipes to become a special talent at home. 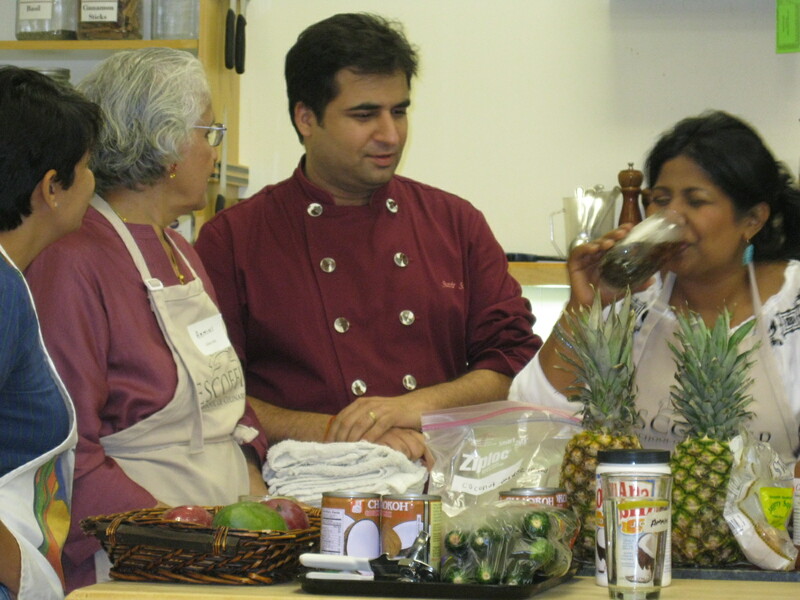 Escoffier does this through their Classes for the Home Cook series, and recently they presented Culinary India, a 2 day crash course on Indian cuisine hosted by 4 talented people, all of whom grew up in India and have strong cultural ties to their home provinces. 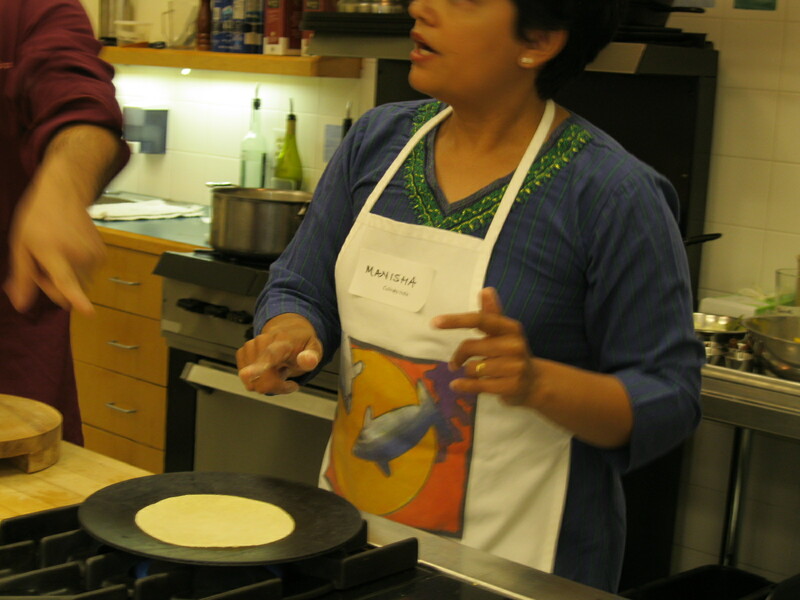 In Part 1, we meet the foodies who showed an eager class of students, connoisseurs, and writers about Indian home cooking. From cookbook author to restaurateur to famous chef, they all had several stories to tell and techniques to share. There was Manisha Pandit, author of the Indian Food Rocks blog; Ammini Ramachandran, a historian, food writer, and respected elder sage of Indian cuisine; Asha Gomez, the owner of the celebrated Atlanta bistro, Cardamom Hill; and perhaps most notably, Chef Suvir Saran of Top Chef Masters, the Martha Stewart Show, author and a country farmer. Like the mixture of spices that would prove to be the magic behind Indian cooking, the mixture of personalities added laughter and a family feel to the weekend. And coincidental to family dynamics, the recipes focused mostly on what Indian families actually make and eat in their homes, not what you might find in a typical Indian restaurant. 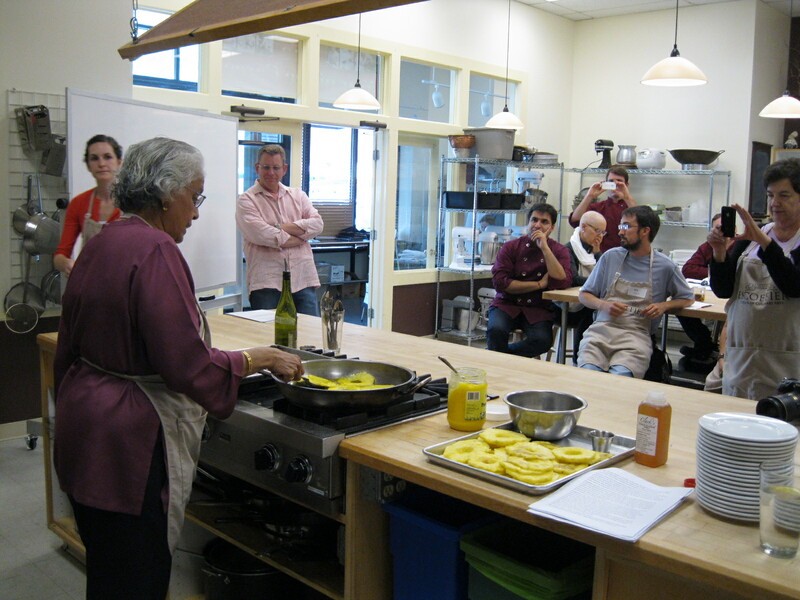 This class was about home cooking, and so naturally, the speakers described what it was like growing up in India. Manisha began by saying that, in some parts of India, men do not cook or clean. But, like so many other things the guest lecturers shared, it is a tradition that helps to explain how things came to be, not necessarily how they will remain. She told of the pro-male traditions with a fair amount of eye rolling and hints of long-simmering frustration, but also with a whiff of quaintness like you might feel about a law against kissing in the town square. More passionately she told us that in the western coastal area where she grew up, seasonality and seafood were the dominant forces. Fresh seafood was a daily staple, except during the monsoon season when fishermen couldn’t get out, but even then, locals would eat dried fish. She also mentioned that breakfast was almost always the biggest meal of the day, because the fisherman had to stoke up in order to make it though a rough day at sea. Manisha walked the talk (swam the song?) by preparing piping hot fresh fried fish, followed by maharashtrian mattha (buttermilk cooler). Asha and Ammini are both from the southern region of India, known as Kerala. This area is a melting pot of different cultures, from the Portuguese to the Chinese, as it was a key trading region throughout history, and remains a vigorous producer of such non native crops as coconuts and rice; both of which play central roles in Keralaian food. You quickly learn that trying to describe Indian food, much less the entire country of India, in a tidy box, is impossible. There are tons of different food types, styles, textures and traditions. The variations create a tapestry of surprise and tastes that slowly unveil on the tongue. Despite the contradictions and diversity, there are some signature qualities to Southern Indian cuisine from the Kerala region, as compared to northern India: in general Southern food is more fruit based and contains less dairy. Southern Indian food is often spicier than Northern food because the weather is hotter. The logic behind this phenomenon is: the hotter the weather, the greater the need for preserving the food in the face of limited refrigeration, and spice tends to preserve the food. Kerala has a multitude of religions, and that also influences what they eat, to a certain extent. Asha grew up Christian (something that, along with her Portuguese surname, Gomez, was imported long ago) and ate some meat, but mostly on the weekends as a quasi treat. This was more of a financial consideration than a religious one, but many of the Muslims in her area were vegetarian. Though not strictly linked to any particular religious belief, Christians tended to eat more meat than the Muslims, and so developed more meat-based dishes. Some God should be thanked for the fantastic grub Asha whipped up. And just as she does in her kitchen at Cardamom Hill, she prepared meals that would often be found in her childhood home. Kerala Chicken Stew, and Kerala Shrimp Stir Fry exemplified the combination of fresh produce, select meat and seafood, and artisanal spices. 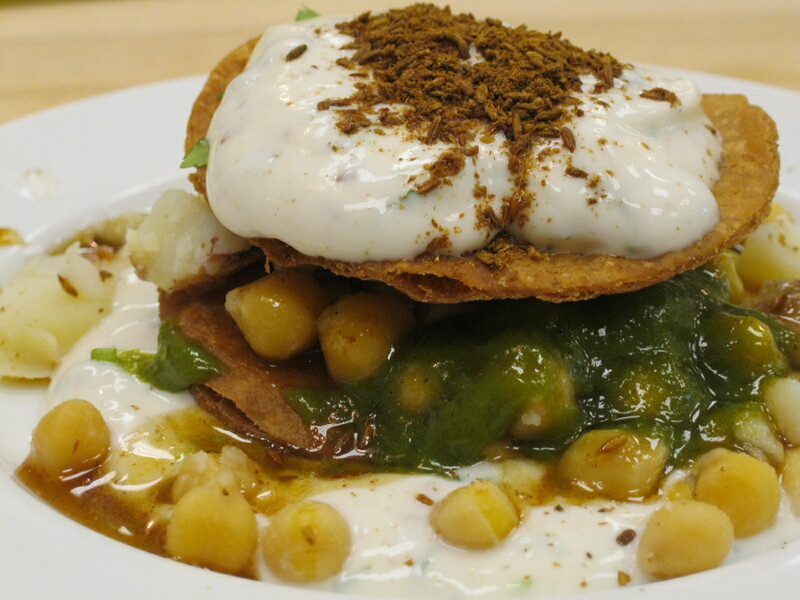 Like all the food served during this class, it was amazingly fresh and layered with flavor. Ammini, affectionately dubbed “older sister” by the other speakers, has an encyclopedic memory of the ancient roots of Indian cooking and tradition, and her vegetarian cook book, Grains, Greens, and Grated Coconuts is rich with illuminating historical anecdotes. For instance, it is taboo to offer food from your plate (or banana leaf) to others—it’s an insult—with the only immunity granted to the personal servants of royal family members, who were entitled to leftovers from their master’s banana leaf. Although that custom may face fierce resistance here (who’s your master? ), it’s more likely to catch on than the Puliyoonoo ceremony celebrating a woman’s first pregnancy. In this fascinating ritual, the woman’s brother pours tamarind soup down a sword into her mouth. The good news is that nobody gets hurt, and the pregnant gal ends up with all kinds of new clothes, and a feast. And feasting is really what Ammini’s book is about. Her recipes embody her mission, which is to have the tongue “…relish the hot, sweet, sour, pungent, salty and astringent flavors.” Amongst other delights, Ammini threw together an excellent okra kichadi (fried okra in coconut and mustard sauce) as well as caramelized pineapple in cardamom and jaggery sauce. Curry powder is an ‘invention of the west’ so generic as to lose all meaning in India. To an Indian, curry means a dish with a sauce. The Northerners, of which he is one, consider garlic an aphrodisiac for heathens. This was said with a smile and arched eyebrow. Indians rarely use broth, so adding salt is a necessary art, and the key to success. 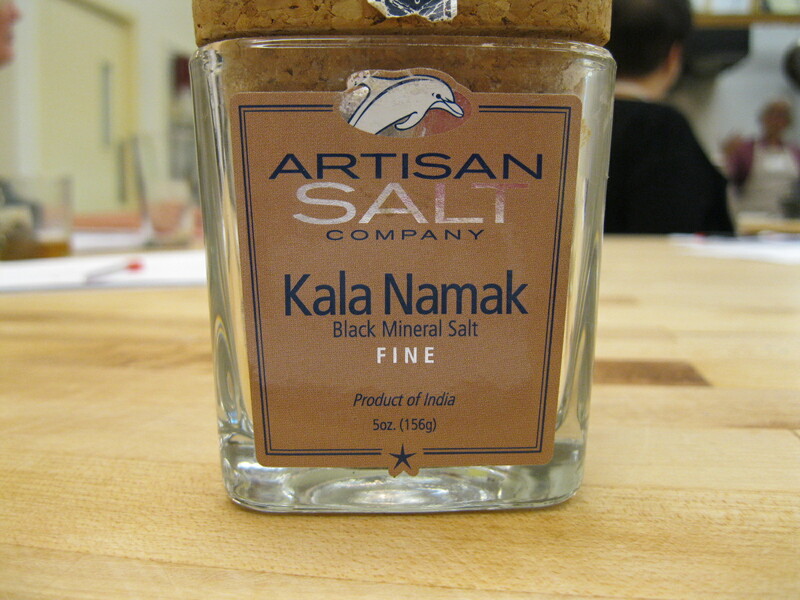 Black salt, he said, “…smells like rats, but tastes like heaven.” It does indeed reek of rancid sulfur, if not rodents. Add salt after cooking, and do so in small increments until you get it just right. For a Hindu, it is an affront to the gods to taste while you cook, so they must be confident and experiment with adding spice in order to develop the perfect balance. 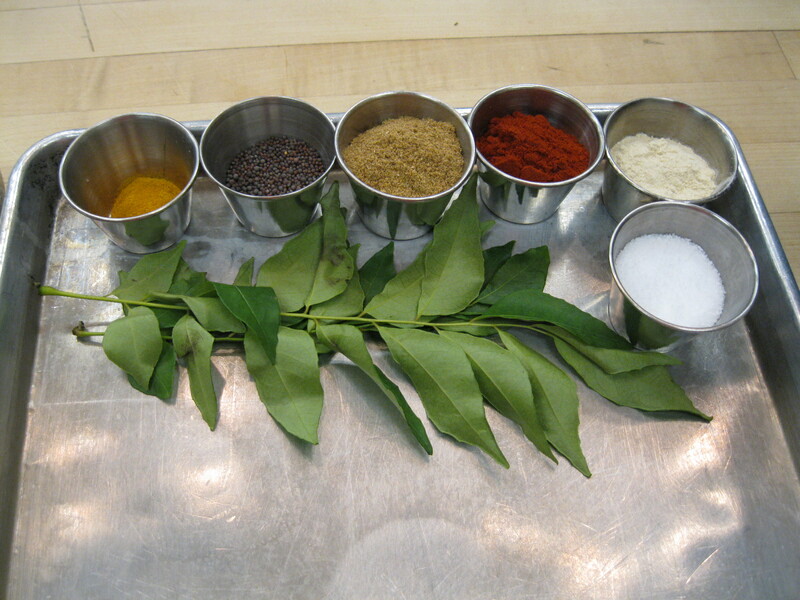 Clearly, the importance of spice and its proper use could not be overstated for Indian cuisine. Closely related to spice are condiments, and apparently, a typical Indian dinner table might have dozens of chutneys and pickles at the ready at any given time. According to Suvir, there should be 56 distinct flavors in each meal, mostly divided between “fire, savory, sour, sweet and bitter”, and that seemed to be an overriding theme from all of the guest speakers: Indian cooking is a symphony of flavors that weave themselves into your heart by way of your tongue, and spice is an excellent way to bring out the best in foods. Not to say they are all spices you would typically have laying about, but from the sound of it, anything you need can be had at Savory Spice, which kindly donated all of the herbs and spices used for this class. 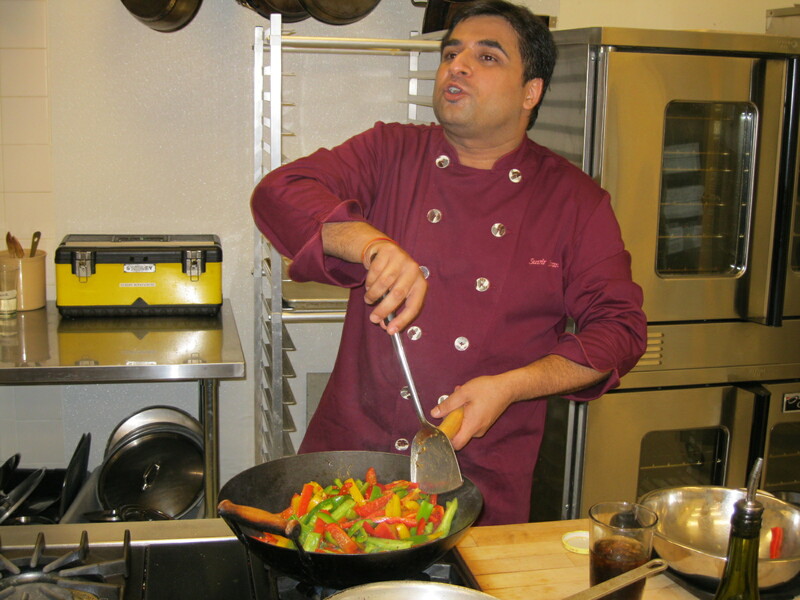 Suvir isn’t “just” a celebrated chef whose yogurt donuts are served by Thomas Keller at the French Laundry; he is a consultant with the Culinary Institute of America, and he advises Harvard about obesity. Although he has a self-admitted addiction to Coca Cola and Doritos, Suvir cares deeply about changing the American diet. Upon arriving in the U.S., he noted that in India, “the elephants are in the jungle—but here, they are in the grocery store!” As such, he preaches sensible portion sizes, fresh, local, farm-to-table dining, and ancient Indian tricks like this: if you need to amp up the sweetness in a dish containing, say, strawberries, add a tiny pinch of black pepper and cayenne or jalapeno; not enough to actually taste; just a hint. The reason? It creates a chemical reaction that fools the tongue, making the strawberry taste sweeter by comparison. In the U.S. we all too often just add sugar or corn syrup to make a dish sweeter, thus piling on stupid calories and carbs. Suvir’s cookbook, Masala Farm, is chock full of anecdotes about life on the farm, tips for living well, and of course recipes. Until you have the time to buy it, two of the lip-smacking dishes he made during class were: tamarind chicken wings, and, roasted cauliflower Manchurian. 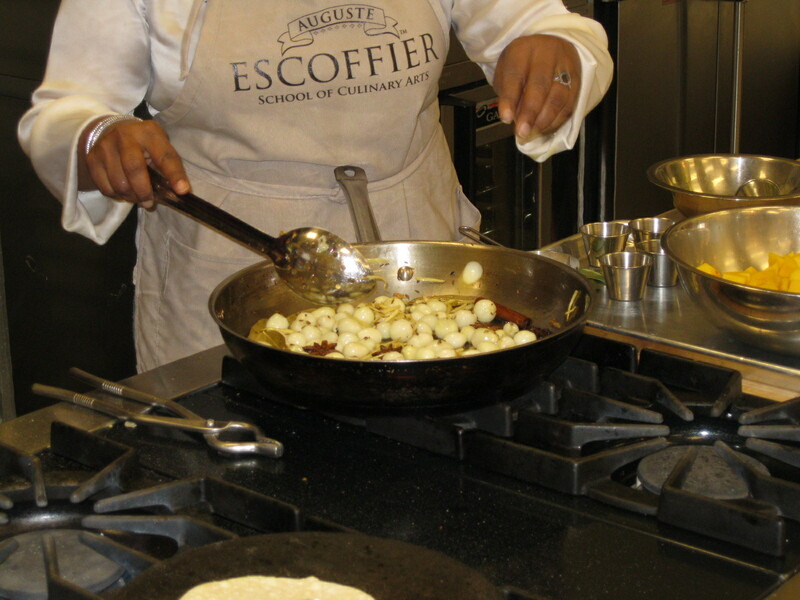 In the part 2 of this 3-part article, we take a look at the Escoffier school, and the kinds of home-cooking classes they offer. Finally, in part 3, we will provide the recipes for the authentic, home-style dishes mentioned above. You are politely but firmly commanded to stay tuned. Thank you, Allan, for this wonderful article on Culinary India. I’m thrilled that the workshop was so well-received. I am indebted to Escoffier for their willingness to host this workshop and it was an honor to teach with my culinary inspirations, Ammini, Suvir and Asha. I’m already looking forward to the next two parts in this series! Thanks again!